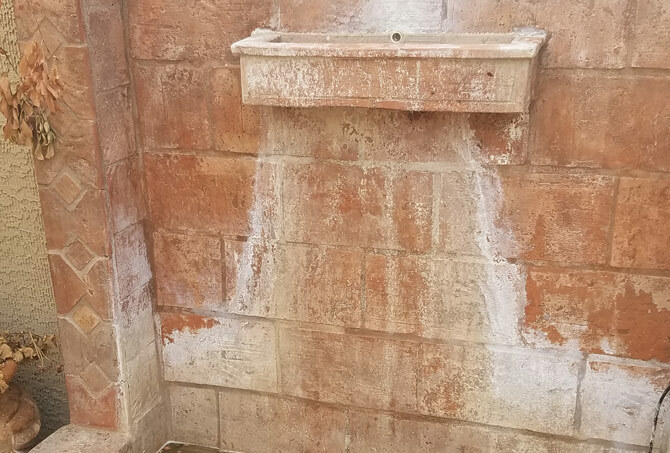 The water deposits gave this fountain a poor appearance. This image was taken after the water deposits were removed. Calcium build up was on both the fountain and the floor nearby. The white, chalky build up is obvious in this before image. This image was taken before any cleaning or restoration work began. 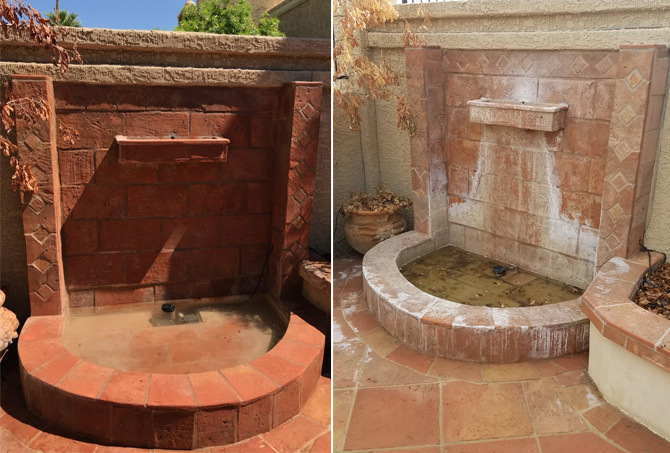 This side-by-side comparison of the fountain after restoration (left) and before (right) demonstrates the dramatic difference our services made. With constantly running water, fountains generally develop a deposit buildup over time. 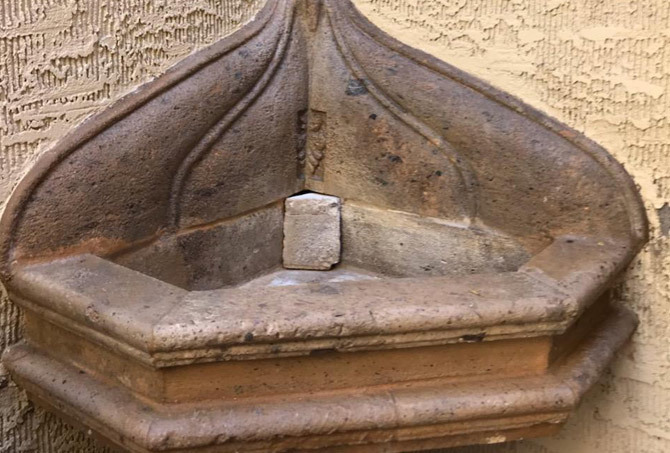 This is a common problem, regardless of the fountain’s stone or tile type. 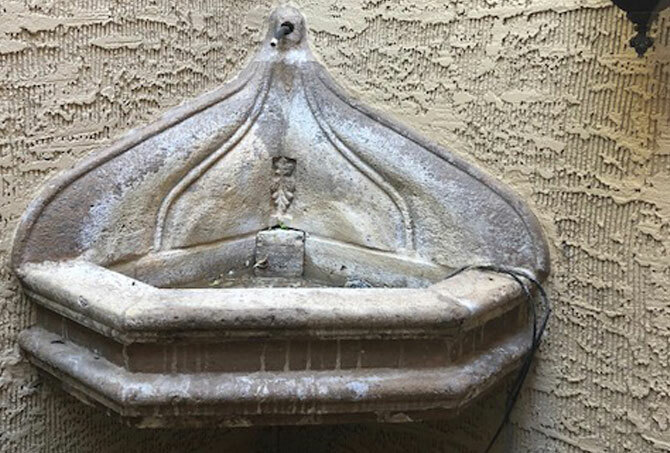 For the Saltillo and cantera fountains in this Phoenix home exterior, the buildup was mainly composed of calcium. Cleaning calcium buildup on Saltillo and cantera can be difficult without the proper tools and cleaning solutions, and DIY methods can damage the tile or stone. Thankfully, our Phoenix clients had the good sense to leave the job to us. 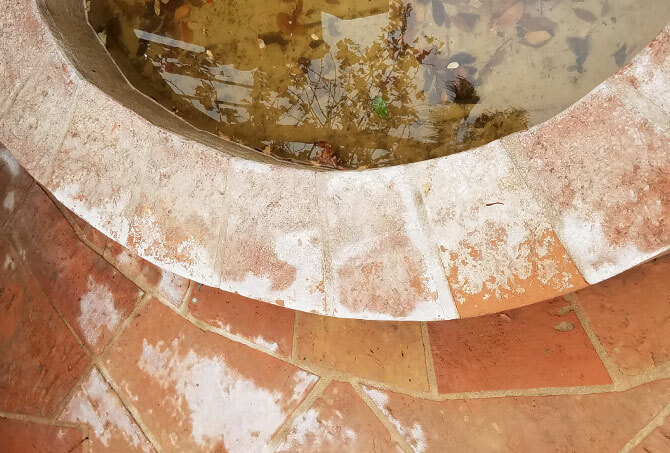 We used a process called dustless media blasting to carefully remove the calcium build up without doing any damage to the Saltillo tiles or the cantera surface. Once the tiles were completely restored, we applied a coat of sealer to protect the porous tiles. Our clients were very pleased to see the calcium build up removed and their fountains looking fresh and clean once again. 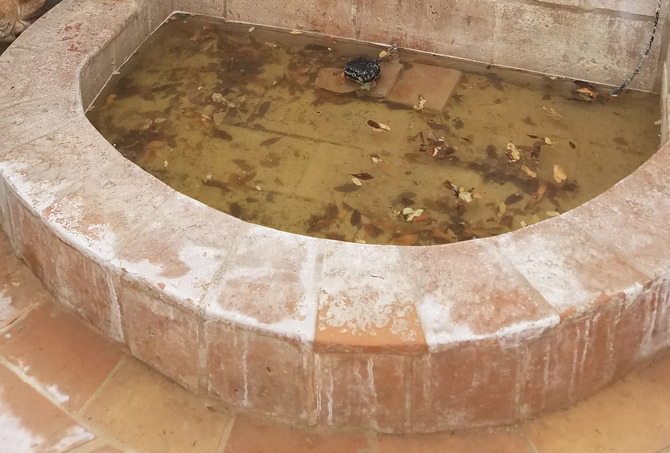 To learn more about our Saltillo stripping, cleaning, enhancing, and sealing services, visit our Clay Tiles and Pavers Services page. To learn more about cantera services, visit our Cantera Services page. For a FREE estimate on cantera services or Saltillo stripping, cleaning, enhancing, and sealing services throughout Phoenix, as well as the Scottsdale and Tempe area, use our contact form or call (602) 993-9800 today.